Nigel Perrin is an internationally renowned choral director who has been Musical Director of Bath Bach Choir since 1990. During this time he has brought  inspired musical leader-ship and  outstanding performance to Bath, its environs and beyond. 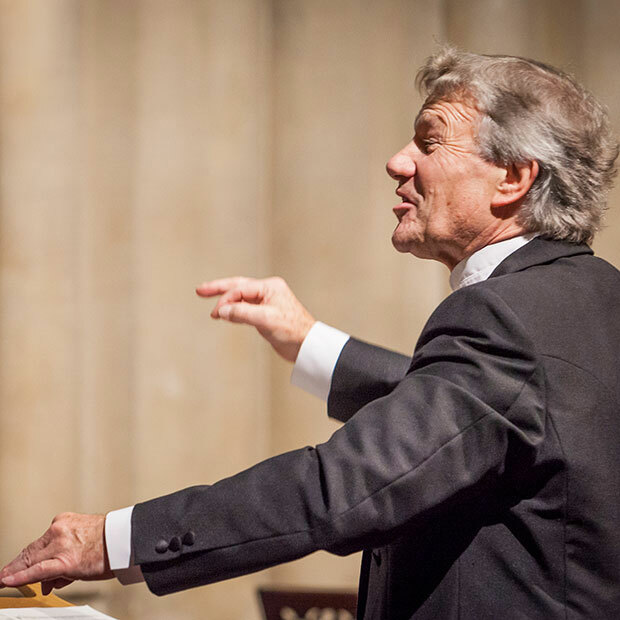 Former King’s Singer and founder of award-winning chamber choir Bath Camerata, Nigel also conducts Exeter Festival Chorus, gives master-classes and runs summer schools and choral weekends all over the world. Nigel started his musical career as a chorister at Ely Cathedral, went on to become a choral scholar at King’s College, Cambridge, where he studied under Sir David Willcocks, and subsequently became well known as the high  voice of The King’s Singers. In a career full of memorable experiences, highlights include recording 25 albums with the King’s Singers and working with George Martin; performing the Royal Variety Show at the Palladium for the Queen Mother’s birthday; re-establishing Bath Festival Chorus and working with Kiri te Kanawa for the Bath Festival; directing the choir for the Three Tenors concert in Royal Crescent, Bath; conducting Britten’s War Requiem in Russia; winning Sainsbury’s (now BBC) Choir of the Year with Bath Camerata; performing the south-west premiere of James MacMillan’s St John Passion; training and conducting the Wells Cathedral School Chamber Choir in live Radio 3 broadcasts; and forming and directing a chamber choir to record the National Anthem for the Queen’s Christmas message.